At first I thought someone threw a rock at my window. The sound of shattering glass was the last thing I expected at 10 in the morning...well I wouldn't have been expecting it any hour of the day, honestly. 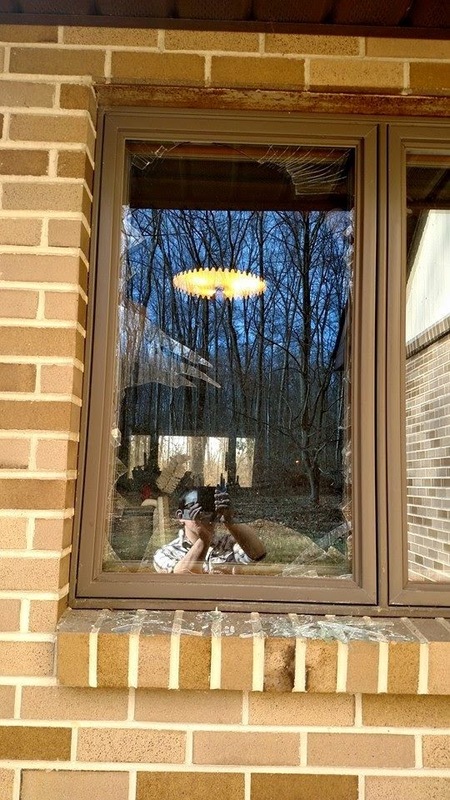 Turning towards the sound, I saw my kitchen window was completely shattered. A textbook size gap was missing from the center, with a spidery web of cracks spiking out from the center. Soon larger sections of glass began dropping off, spreading the hole. Looking out the window, I didn't see a rock, but a large ruffled grouse laying still on the ground. Walking outside, I noticed the grouse had only broken the outer pane of the double-walled window. 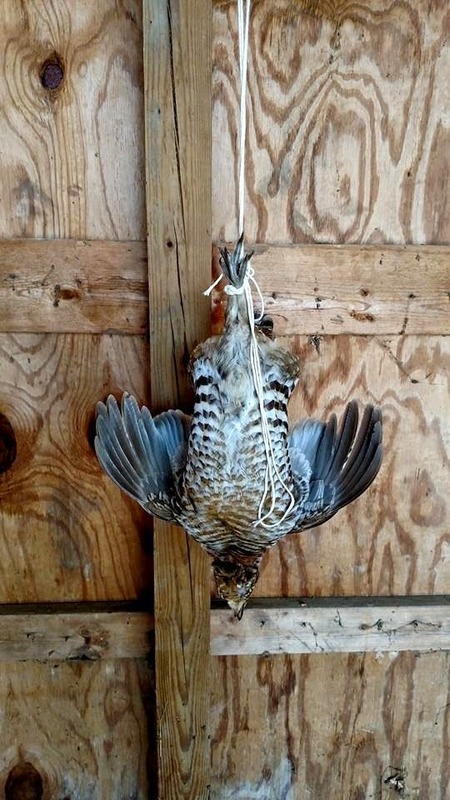 I picked up the grouse, which was now dead, and carried it up to an old wooden carport on the side of our rental property. Holding the grouse, I couldn't help but think of how beautiful it looked. It really did have a mane of feathers around its neck. Online I saw how impressive they looked when the feathers were completely puffed out and "ruffled" in display. The grouse's spine was shattered right between the shoulders from the impact. I knew I would cook and eat the bird; not only is it a famous game bird for eating, there seemed to be something wrong about just throwing it to the crows. Cleaning the grouse, no blood came out. When I finished plucking the bird, I eviscerated it and found most of the blood had been lost to internal hemorrhaging, along with both sides of the rib cage being broken. Classically, grouse is known for being a strong tasting and smelling bird. I didn't encounter any smell, but perhaps the stronger smell is restricted to the more famously documented Red, or Scottish, grouse species. 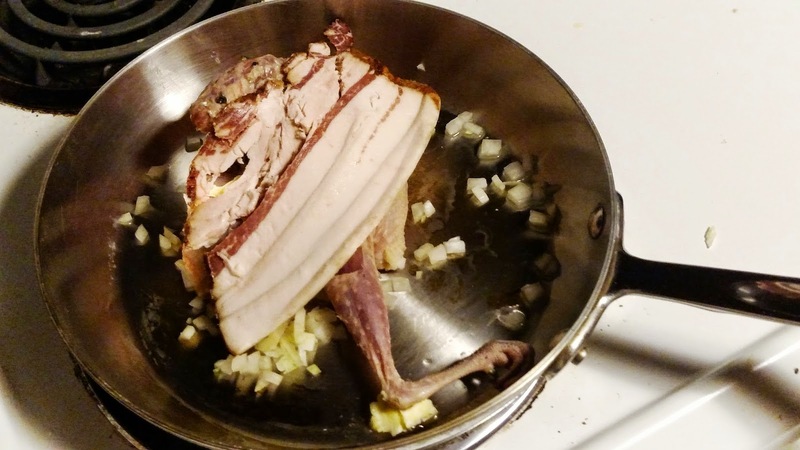 I let the bird rest in a mild brine overnight to season the dense meat and let the muscles pass out of rigor mortis. The next evening, I brought out the grouse to cook for dinner. Sticking with the classic preparation, I rubbed the grouse with butter, thyme, salt and juniper berries, then roasted it under a few slices of bacon. 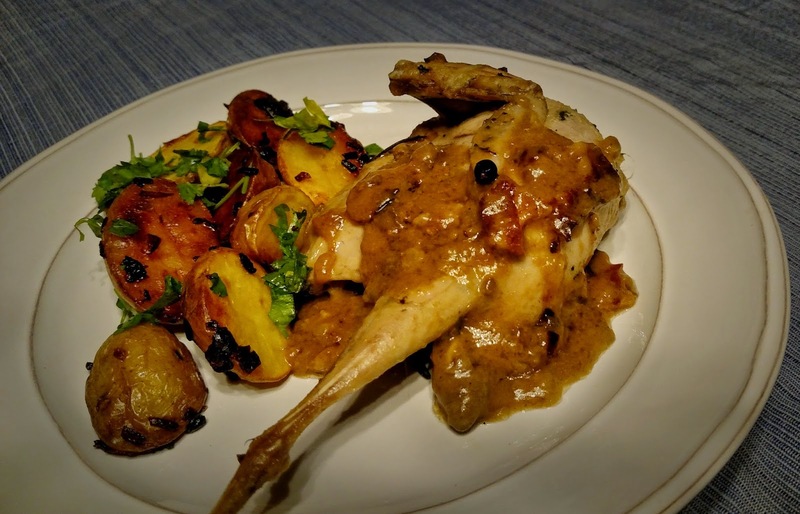 When the grouse was cooked, I made a sauce of the pan drippings, bacon, sherry, and thickened the sauce with the grouse's mashed liver and a flour roux. 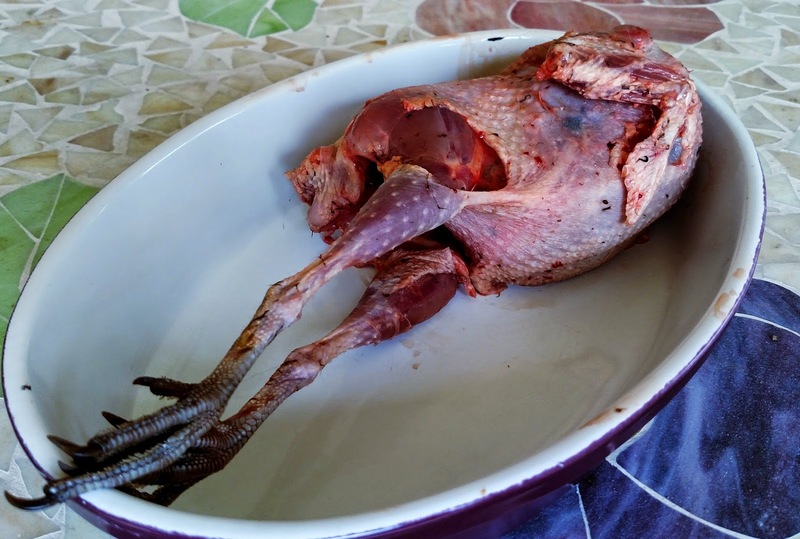 Aside from the leg meat, there wasn't much of a "gamey" flavor to the grouse. Even the gaminess of the legs was milder than I expected. It's hard to describe the taste of the meat, which was milder than expected, but very flavorful. It wasn't gamey, liverish, or beefy, but just had a wonderful savory flavor, like the taste of poultry to the second power. While a peculiar turn of events, this certainly made for an interesting day. Excellent account of a ruffled grouse hitting your window. Can't wait to read the sequel about the prowling black bear in the neighborhood hurtling through the door. But you'll need a bigger pan.